Speaking in a general sense, I'd put my money on Hongdae having the best overall Japanese food scene in Seoul after the Japanese-heavy community of Ichon-dong. On top of some really nice Japanese ramen joints and okonomiyaki bars, there's quite a plethora of donkatsu, donburi, and Japanese curry establishments scattered around the neighborhood among other offerings. One of the better known spots for Japanese curry in not only Hongdae but Seoul itself is Pakumori which I'm introducing today. Pakumori started off in Japan during the early 90s by Japanese-Korean Mori Yukio. He apparently spent a great number of years researching and testing curries until he developed a recipe for his "pakumori curry" which the restaurant touts as being the best match towards the palettes of Easterners. Perhaps as a reflection to this claim chef Yukio has won a number of prestigious awards and distinctions for his curry in Japan since then, appeared a few times on television, and his popular chain of curry restaurants spread to Korea where four Pakumori chains (so far) are in operation with plans to open more branches still. The first branch, in Hongdae but closer to Sangsu, is a small joint which was the branch I visited. At peak lunch and dinner times you're likely to run into a line in this humble and unassuming joint in Hongdae. Part of it is due to the limited seating in this branch which can only accommodate about 30 or so people. In addition to curry rices with various toppings, you can also get it in a udon and soup format. If curry isn't what you're craving, they also carry a number of donburi bowls. Like most places in the area, prices are relatively moderate with a plain curry going for 5,300 won and the most expensive item- the beef curry, going for 11,500 won. They also carry Japanese beer (Kirin and Asahi) as well as soft drinks. The side dishes brought out are simple and basic: just kimchi and pickled small peppers. The last time I visited, I went with my dad who ordered the niradamadon (7,000 won) which is a donburi of shaved pork and chopped chives that's topped with a loose and slightly runny egg. I sampled a few bites and was generally pleased. It was sizable with a generous amount of meat, chives, and other toppings. I appreciated the fact it wasn't overly salty or sweet which a lot of donburi tend to get sometimes. For the record, Pakumori's website says it uses a special soy sauce developed by the restaurant which perhaps is why the donburi seemed less salty than other places. The big draw however, as I mentioned, is Pakumori's famed curry which is a bit different from your standard Japanese curry all over town. There are three basic curries you can choose: the plain curry (5,500), the omelet curry (7,500), and the dry curry (7,900). From there you decide the spicy level- regular, slightly spicy, spicy, and very spicy. A range of toppings, for extra charges, can then be chosen to be included with your curry including vegetables, sausages, cutlets (chicken, pork, ham), fried shrimp, cheese sticks, mushrooms, and more. The cheapest topping is a soft boiled egg for 1,000 won while the most expensive is the mix of fried goods (shrimp, cutlet, and fried chicken) for 4,000 won. The fried chicken (3,500), or karage, seems to be a very popular choice but I chose to go with the croquette (2,000). The signature dish for Pakumori is its dry curry which is touted by them as having a deep flavor from its complex makeup which includes some "10 kinds of vegetables, 18 spices, and collagen broth". A simple bowl of rice sit atop the pool of plain curry but the rice comes topped with the famed dry curry. This unique dry curry resembles a cooked meat patty but it's actually a mixture of pork and chicken, vegetables, fruits, and spices which is combined, dehydrated, and fried over an 8 hour process that results in the unique dish. Sounds questionable in description but it tastes better than it sounds (but more on that a bit later). The wet curry definitely has a deep flavor than most curries but it's subtle as curry has a pretty thick and deep taste to begin with. The real star though, undeniably, is the dry curry. On first glance it doesn't look like much and it even comes off as rather dry looking. But cutting into the unique mixture gives way to a moist and flavorful composition which adds a nice new texture and dimension to the plain curry and rice. Scoop some of the curry on top of the rice and dry curry mixture, give it a mix and it's like an extra dimensional, loaded curry. The croquette (2 of them) came hot from the frying with a nice crust and soft interior. It was perfectly fine but nothing extraordinary. All in all, prices are decent, service is quick, and food is solid. The dry curry is pretty unique and worth checking out if you're a fan of Japanese curry but wanting something different. Walk about 250 meters from exit 1 of Sangsu Station until you see an intersection that turns right with a Dunkin Donuts on the corner. Turn right and walk up for about 50 meters and you should see Pakumori on your right. Try and avoid peak lunch and dinner times as the lines can get quite long. 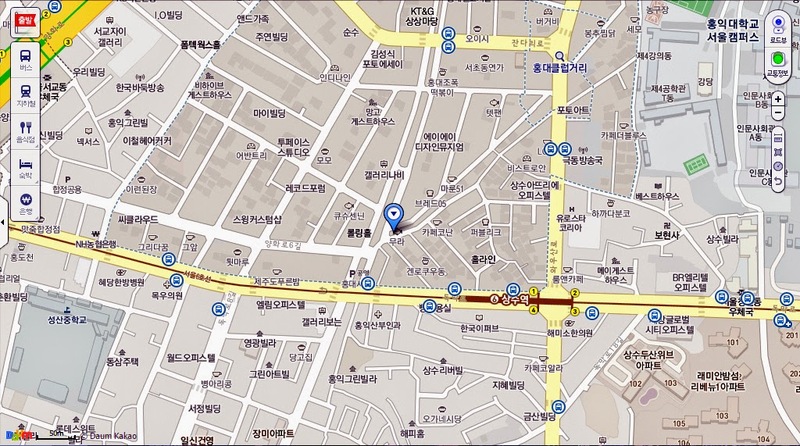 Three other locations are found in Myeongdong, Incheon, and a second Hongdae branch closer to the Hongdae subway station. Though seating is limited, Pakumori welcomes solo visitors and even provides a portable CD player and CDs for solo visitors to listen to while dining.